Seniors in Rabbi Beitler and Rabbi Tani Cohen’s shiurim had the priviledge to meet with YU President and MTA alum Rabbi Dr. Ari Berman this week. As we sat around the large conference table on the 12th floor of Belfer Hall, I couldn’t ignore the symbolism. Here we were in the office of Rabbi Dr. Ari Berman, President of YU and thus the most visible face of Modern Orthodoxy, talking about the Modern Orthodox high school system. We discussed our goals in high school and beyond in an authentic, frank way. Rabbi Berman asked us thought-provoking questions – “How do you feel Modern Orthodoxy is doing, and what should it be doing?” – was the theme throughout. We walked away from that morning with a sense of relief that someone is thinking about these questions, and with G-d’s help, we will find the answers. 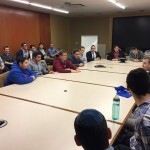 Having access to the opportunities YU has to offer, while still experiencing the warmth of a yeshiva high school, is one of the most unique advantages of being a student at MTA.